The Moreton Bay Region offers some of the most scenic locations in Queensland to holiday, from the famous Pumicestone Passage to our stunning National Parks, our scenic seaside and our lakes and dams. This list is for everyone, from the beginner camper to the seasoned ‘bushie’, we’ve found the best places to provide the serenity you need to unwind and relax these holidays! If you’re a novice camper, check out the camping tips at the bottom of the article. 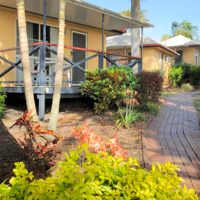 Bongaree Caravan Park offers a tranquil base from which to enjoy all that Bribie Island has to offer. 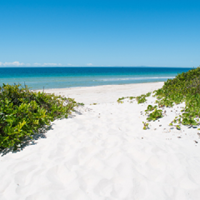 Just across the road from the famous Pumicestone passage, home to wildlife such as dolphins, dugongs and turtles. The park has a variety of accommodation, from camping to caravans, as well as on site holiday villas and cottages. 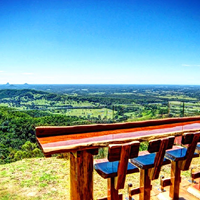 Enjoy spectacular views of Pumicestone Passage, the Glasshouse Mountains and the Redcliffe Peninsula. Swimming is very popular for all ages in the calm water beaches. There is great fishing, a number of walking paths to explore the area plus it’s within walking distance to local shops & restaurants. Ocean Beach Camping Area is located 16km to 19km north of the beach access point on North Street, Woorim. The camping area is in a prime location on the Eastern side of the island with Freshwater Creek nearby. If you’re an avid fisher, this is the spot for you! The campsites do vary a fair bit between sites with a combination of sand, dirt and some grass. The camp sites just behind the dunes are accessible from defined track entrances, make sure to use these and do not drive over dunes. Camping is not allowed in the foredunes or on the beach. The site is 4wd drive access only and you will need a vehicle access permit. 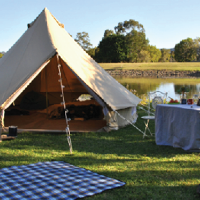 Neurum Creek Bush Retreat provides dog friendly camping grounds. Enjoy the great outdoors with many activities including trail walking, swimming, canoeing, and much more! 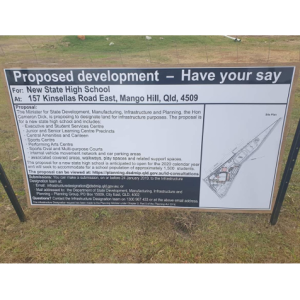 The township of Woodford is a twelve minute drive away, where you’ll find friendly service and advice as well as being able to cater for your needs be it food, refreshments, fuel, restaurants, etc. The site of the famous “Woodford Folk Festival” is only fifteen minutes away. If you book a campsite for the week leading up to Christmas, expect a visit from Santa and the local firies! Campsite owners, Simon and Tracey, are also gearing up to host Australia Day with live music and more! 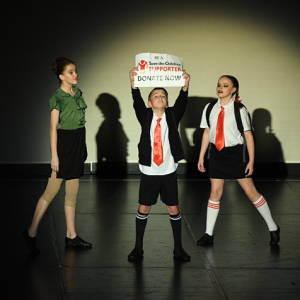 Image courtesy Jack Purton. 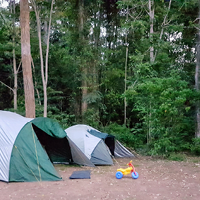 Located just thirty minutes north of Brisbane in the spectacular suburb of Kurwongbah is the gorgeous Murrebong Campsite. 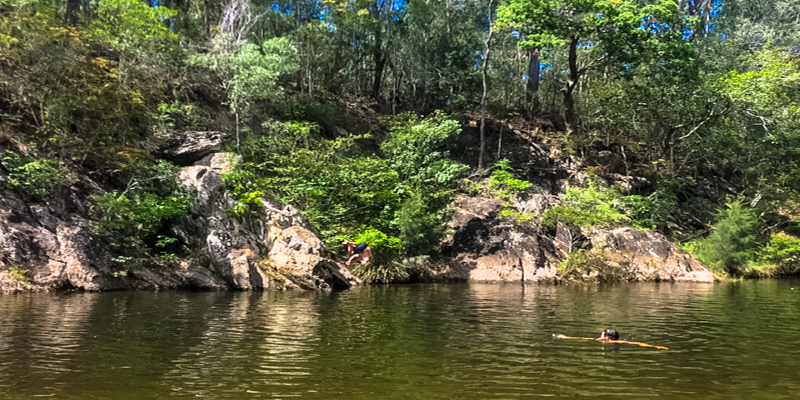 Known for its traditional bush camping, walking trails and large dam, the Scouts QLD campsite offers a peaceful setting for even the most basic camper to spend a few days to recharge and get away from the hustle and bustle of life. 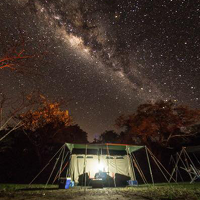 The campsite offers bush camping, non-powered sites and has a bunk hut and dining hall/kitchen for larger groups that wish to stay onsite. Bookings are essential and can be made with the onsite staff. Middle Cobble Bush Camp is a remote bush campsite in an open grassy area next to Kobble Creek, in the remote northern section of D’Aguilar National Park. This campsite is for the more experienced campers as it is walk-in camping only. A short walk takes you to the top of Kobble Creek waterfall. Keep an eye out for the prehistoric-looking Lepidozamia (cycads) on your walk to the bush camp. 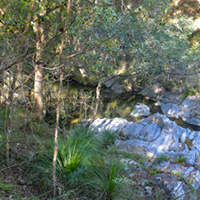 Skinks and keelbacks (freshwater snakes) can be seen basking on the rocks at the top of Kobble Creek waterfall. Bottlebrush plants flower along the creek beside the bush camp site in Spring make for a stunningly scenic hike. Image courtesy of Rolo. 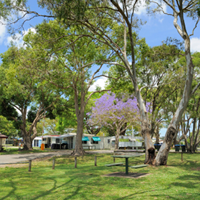 If boating and fishing is your thing, Donnybrook Caravan Park provides the perfect get-away holiday in a peaceful seaside village. Launch your boat from the adjacent boat ramp and cruise out into the picturesque Pumicestone Passage for a relaxing or fun-filled day on the water. Return to your caravan in the afternoon and enjoy a relaxing barbeque or head to the local bowls club for a meal. A general store and post office across the road and a take-away next door provide for your basic needs. This spot is perfect for the keen fisherman! Set on 40 acres of pristine land in the hinterland of Ocean View, the retreat overlooks the Glass House Mountains and Moreton Bay. Worldsaway Retreat is a 10-minute drive from the yesteryear town of Dayboro and quaint village of Mt Mee. Wineries, restaurants and Mt Mee State Park are all nearby. You’re offered a stunning, open space to relax, unwind and re-energise. Right in the midst of nature, Worldsaway Retreat is a sanctuary to soothe your soul, your body and your mind. If you’re not a fan of pitching a tent, you can always choose the glamping option of their self-contained cabins. The surreal, breath-taking views will seize you with the amazing Glass House Mountains, ocean, islands, waterfalls, valleys and forests. It’s almost unbelievable. 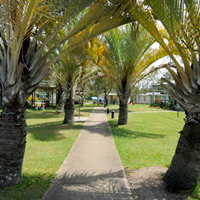 The beautiful Baden Powell Park campsite, owned by Scouts QLD, is a 150-acre leafy green site within walking distance of the quaint Samford Village. The site boasts a 25 metre swimming pool, endless walking tracks, hot water showers and a large dam with plenty of fish to catch! They also have equipment for hire, such as mountain bikes. There are various accommodation options available to public campers, so if you prefer the glamping option, you can hire a bell tent. Bunk huts are also available or powered sites for you to park your caravan. Bookings are essential and the campsite is sometimes not available due to Scouting events. 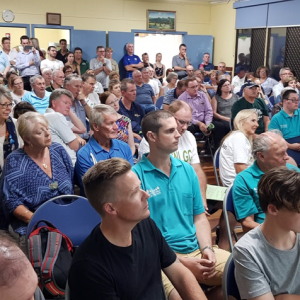 Boating and fishing in the adjacent pristine waters of the Pumicestone Passage makes Toorbul Caravan Park the ideal getaway spot for the fishing and water sports enthusiast. Boat ramp, fishing supplies, convenience store and tavern are all within 400 metres of the park in this peaceful, seaside community. Kangaroos wandering the streets in the late afternoon make this a unique holiday location! The park offers good facilities for caravan and campers, including a BBQ area, large amenities block and a coin operated laundry. It is recommended that bookings be made well in advance to ensure availability of a site. – Always take plenty of fresh drinking water. A lot of campsites only offer potable water, which is fine for bathing and extinguishing campfires. If you need to use the water for drinking, it MUST be boiled for a minimum of ten minutes. – Not all campsites allow campfires, so it is best to check beforehand. It is also advisable to check whether there are any current fire bans in place. – Bring firewood. Often you will see roadside signs with local residents selling pre-cut wood. It is ILLEGAL to collect wood (even dead branches) in National Parks and you could face a hefty fine if caught! Campfires must be contained and extinguished properly with water. Wildfires can start from embers. Be responsible! – Ensure you deflate your tyres for beach driving, around 16psi is the standard. Check the tides guide! – 50+ Sunscreen, Bushmans 40 deet (insect repellant), a fully stocked first aid kit, a pair of thongs for showering, torches and a packet of baby wipes are absolute essentials. – Do not feed the native wildlife! Ensure all food is secured and away from the reach of all wildlife or you may find it all gone whilst you are away from the campsite or sleeping. – It pays to look around for ant nests and insect holes prior to pitching tents and gazebos. – Arrive at your campsite while there is still plenty of daylight, setting up camp can be quite time consuming and setting up in the dark isn’t as fun as it might sound. – Some campsites don’t offer rubbish disposal, pack some garbage bags and make sure your campsite has no rubbish laying around before leaving. – Lay a ground sheet (most tents come with one) or a tarp at the entrance to the tent and make it a no shoe zone. This prevents a lot of dirt inside the tent and makes for a more comfortable sleep. – It’s a good idea to leave the netting on the tent entrance zipped up at all times, except for entering and exiting, unless you want to share a bed with snakes, spiders and mosquitoes! – Make a list of what you intend to pack but bear in mind that you’ll likely still forget something! Don’t forget the coffee! – Check yourself for ticks!